A well stocked trunk is the key to surviving a winter driving emergency. As snow begins blanketing the country, it's time once again to hear tales of the grossly unprepared as they look into their trunks and find only a rusty jack and a broken umbrella. Whether you are driving through Buffalo during a lake effect storm or navigating an icy mountain pass in Montana, you need to be prepared. Do yourself, your family, and your community a favor by outfitting your car for snow and ice with a winter survival kit. Be prepared by avoiding peril. Be prepared to dig yourself out. Be prepared to walk out if help doesn't come. In order to stay on the road, you need to be able to see the road. Invest in a good set of winter wiper blades, (remembering that wiper blades are not windshield plows) and treat your windshield with an ice repellant like Rain-X. Also, always make sure you have plenty of cold-weather rated windshield washer fluid in your reservoir and keep a spare gallon in the trunk. It is also a good idea to review your owner's manual so YOU know how to add fluid when it is low. My least favorite moron, is the person that clears a little patch in the front windshield to peer out of and creates a mini blizzard as the snow blows off their car behind them. You have a snowbrush, right? Please use it to totally clear off your car or someone will stick it in a place you'd probably rather not have it. Lastly, as you drive through the slush on the road, a vehicle's headlights become caked with salt and ice. Make sure you clear your headlights, taillights, and directionals periodically with a rag or brush. Griffin's advice to stay off the streets during a major storm is fantastic advice, even to us hearty Buffalonians who thrive on the infamous reputation of our snowy city. Now there are times when you can' t stay at home and you must venture out. Sadly, many bosses wont give you a six-pack day to avoid icy roads. Also, as a winter mountaineer, it's hard to drive six hours to the Adirondacks in January without encountering winter driving conditions. In our lives in the North, a little snow must fall, and yes - we'll be driving through it. So if you can't stay home during snow and ice events, focus on preparing your vehicle and preparing your winter driving skills. You don't have to dig out, stay put, or walk out if your car stays on the road. In order to stay on the road you will need traction. For those of you driving with bald tires - what is wrong with you? Though winter tires are the best for driving on snow and ice, even a good set of newer "all-season" tires will do the trick. In extreme ice and snow, especially in the mountains, pick up a set of easy applying tire chains. For rear-wheel drive vehicles add a few sandbags to the trunk or truck bed - this helps immensely putting weight over the drive wheels. I used to drive a mustang through the snow and had few problems once I switched to Bridgestone Blizzak tires and put about 150 pounds of tube sand in the trunk. Sometimes having the best tires,all-wheel drive, and a clear view doesn't cut it - you need to practice your winter driving skills. Your first skill as a driver is to make sure your car is properly maintained going into winter, the worst time to break down during a giant snowstorm because you added the wrong weight engine oil. The first rule of winter driving is to decrease speed and increase the following distance. If you tailgate or drive like Mario Andretti in a snowstorm, you are asking for trouble not just for yourself but others around you. Treating your windshield with Rain-X will repel slush and ice. Visibility is key to winter driving. 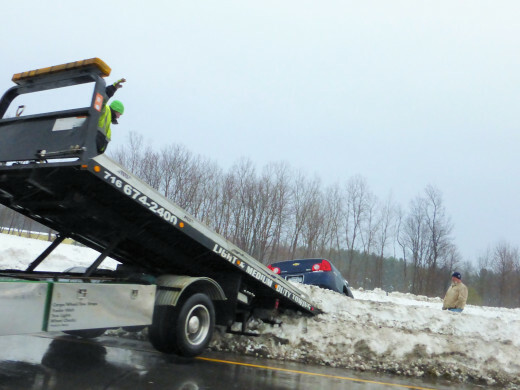 Sometimes even the best drivers can end up in a ditch or drive their vehicle into a snowbank. Granted, the worst drivers do this more often but you should be prepared anyway to dislodge your vehicle from the snow. I heard somebody out there say, "But I have AAA, they'll get me out." Absolutely, I have them too, but what happens during a blizzard with multiple requests to every tow operator in the area? What happens if you are out of cell phone range? That's right, you may have to get your own car out of the snow. As a safety note, if you are stuck on a road please watch out for other traffic. Try to make the car and yourself as visible as possible. Pop flares, wear blaze orange, whatever you have to do. NEVER SPIN YOUR TIRES! Spinning your tires reduces the traction you have and just creates deeper ruts in the snow. Shift your vehicle into low gear and go very easy on the gas. You may also try turning your tires from left to right to attempt to get traction. You may also, depending on the kind of car you have, try rocking the vehicle by shifting from forward to reverse and going easy on the gas. Many times you can roll yourself out of a snow rut without digging. However, the rocking technique is not good for the transmission of many vehicles: consult your owner's manual before attempting. So it looks like the car isn't going to just ease out on it's own does it? Let's give it some help. Take out your shovel - you have one right? Begin to dig around the tires and underneath the car. Also you may want to shovel a path so your car can proceed once free. Now take out your traction aids and place them under the drive tires. If you aren't sure which tires are the drive tires, they are most likely the front ones. Some people swear by kitty litter, but my plastic traction aids work pretty well. In a pinch, you can use your floor mats but most likely the floor mats won't survive. Now that you have some traction under the tires and the snow cleared away, try the steps from the first attempt. To gain traction, some people suggest letting some of the air out of the tires; however, do not do this unless you have an air compressor with you. Remember, do easy on the gas! So the car still isn't moving and appears to be stuck. You've shoveled out as much as you can, have traction under the tires, and have gently tried to ease yourself out, and nobody is coming to help you. Now, let's say you need to get out, you may wish to contemplate winching yourself out with a cable hoist. Chances are you'll damage your car attempting this, so I don't recommend it unless you are in a dire situation and know what you are doing. 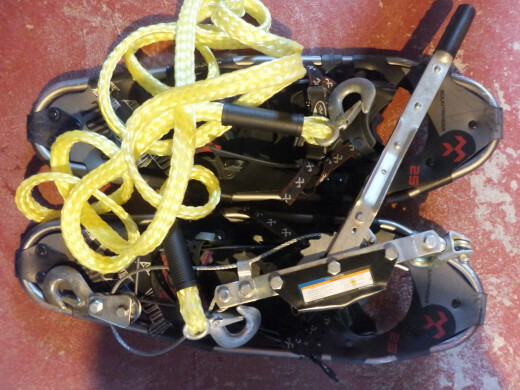 I have used the cable hoist I carry in my trunk to dislodge my car from an icy Adirondack snowbank. It was in a pinch, where cell phone signals don't work and I had a good accessible spot on my frame to hook up the tow strap. Again, if you use this method, be extremely careful. A collapsible snow shovel is a necessity for every winter traveler's trunk. 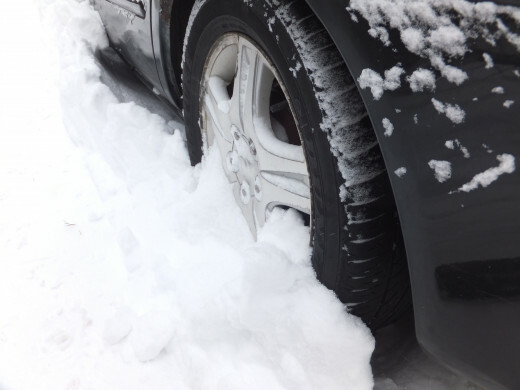 Sometimes, despite good driving habits and all honest attempts at digging out, your vehicle will be stuck until the tow truck or spring arrives. Generally your best option is to stay with the car. Your vehicle offers protection from the harsh winter elements and from oncoming traffic; however it can quickly become a danger if used improperly. The first step when deciding to shelter in place is to conserve your body heat. Remember that most clothing, especially cotton, loses its thermal properties when wet and will actually make you colder. Remove wet clothing and wear synthetics or wool, both of which have the ability to keep you warm despite dampness. Remember to wipe any snow off your clothing before getting back into your car. 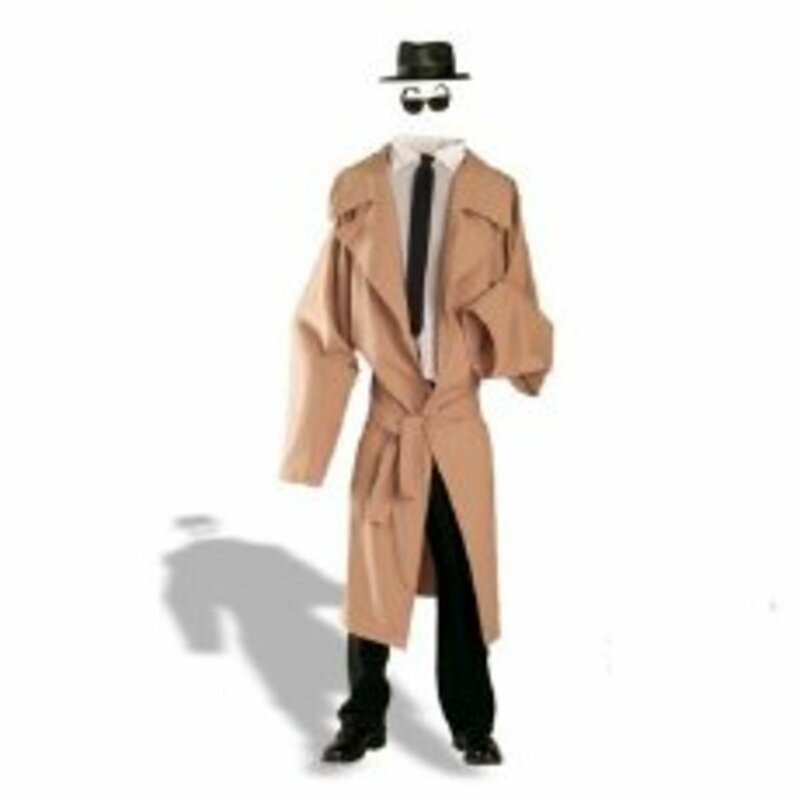 After changing your clothing, find ways to draw attention to your car and let other vehicles know that you require assistance. 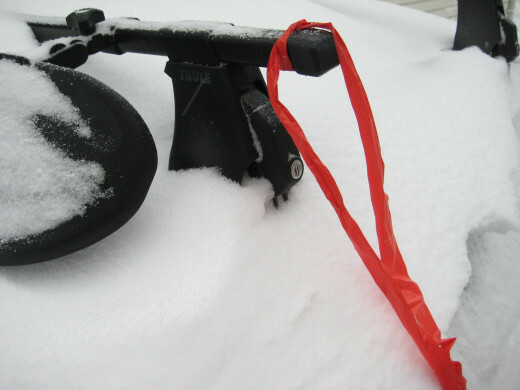 Attach flagging tape your antenna, ignite road flares, and clear snow away from your car so it doesn't look like just another snow bank. You may also want to put one of those "Help" signs in the window; it helps especially if you are sleeping. Next, you will want to make sure you continue to have heat. Yes, you could run your car's engine and use your heater, but sooner or later you will run out of gas. Also, there is a carbon monoxide danger in case the tail pipe clogs with snow. One thing which works well as a heat source is to light a multiwick candle and place it inside of a larger can. Just light it, slightly crack a window and feel the heat. Continue to make body heat by exercising and eating, then further insulate yourself by climbing inside your sleeping bag. This 65-piecce winter survival kit from AAA has nearly everything your car needs, from first aid to an emergency blanket. Walking out to find help is potentially the most dangerous action you can undertake when you and your vehicle are stranded in the wild by a winter storm. Remember how James Kim tried to walk out of the Oregon wilderness to save his stranded family and met death from exposure and hypothermia? Take a lesson from that tragedy, and don't let the next Dateline special be about you. Before setting on on foot ask yourself the following questions? Do I know exactly where I am and where I am going? Am I prepared to stay out in the cold overnight? Am I an experienced winter traveler? If you answered "no" to any of these questions, you had better stay put until help arrives. When should you walk out for help? When it is a more dangerous situation to stay with the vehicle. When there is no possibility of rescue. If you are planning on abandoning your vehicle, you must be prepared for all the nasty circumstances that winter foot travel can throw at you. 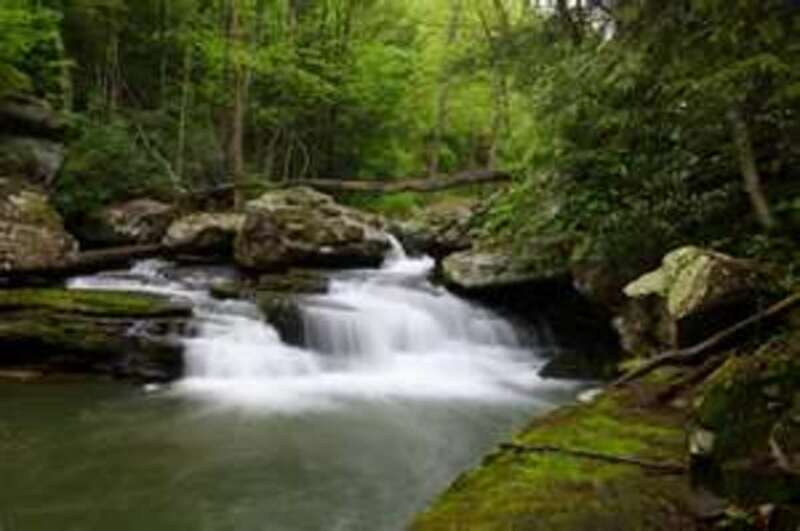 Besides proper winter clothing, you'll need winter camping gear, survival equipment. Don't forget that walking on snow and ice has a much higher physical toll than regular walking. 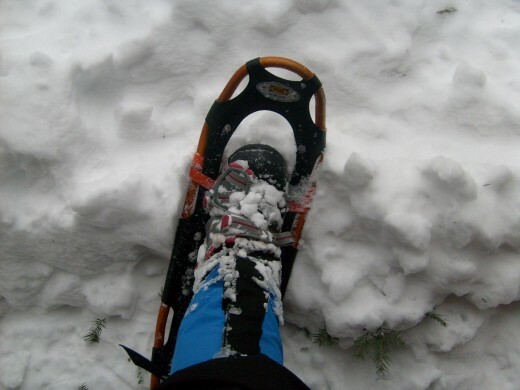 Make walking easier and safer by wearing snowshoes in snow and ice walkers on ice. Remember to leave a note on your vehicle dashboard detailing which way you walked and where you were going for help. A note may help rescuers locate you faster, especially on an overland route. Snowshoes are a fantastic way to explore the winter landscape and are mandatory for an emergency walk out. 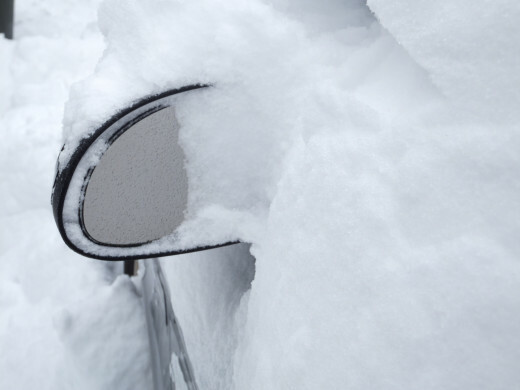 Do you keep a winter survival kit in your car? 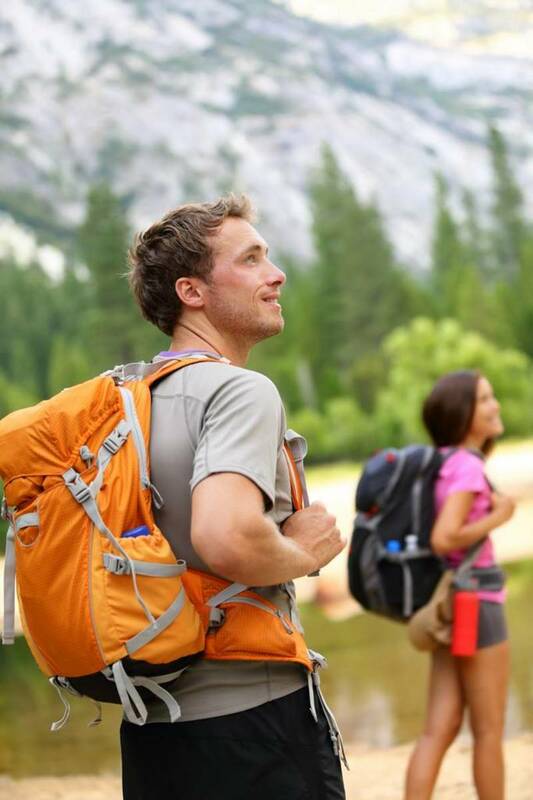 Backpack large enough to carry ten essentials, shelter, and sleeping bag. What sort of items do you keep in your vehicle for winter travel? Please add them in the comment section below. Outbound Dan Another great hub with lots of great advice. I am going to read more of your hubs and give you comments on each one I read. Keep up the great work and keep on writing great hub articles that are useful. Gardener Den. I keep one of those mini compressors in the car too. Even though I think I've used it more for other cars than my own it is handy to have. It sounds like you are well prepared for unplanned roadside adventures bensen 32. Thanks for reading! 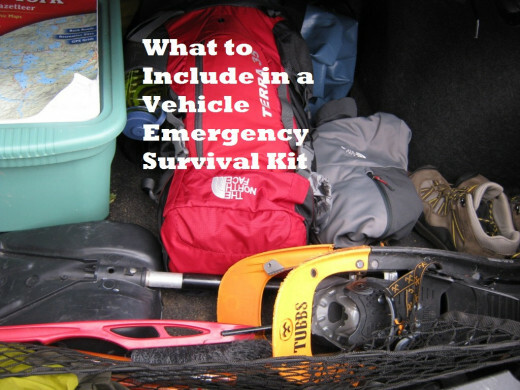 Great article, Yes even though my family laughs at me, I have a summer and a winter survival kit for the car. I have just about everything you named, I also have the mini compressor that you plug into the cigarette lighter to fill your tires, I have yellow flashing light you can plug in too and put on the roof of the car. 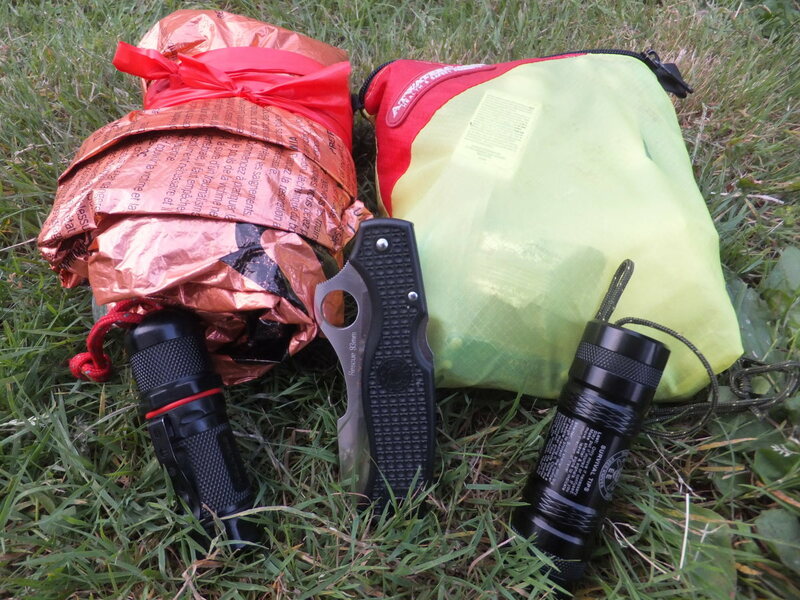 I also carry in the backpack 2 MRE's and a 2qt military water bottle. That's right - the cheap, non-clumping, gravelly litter is all that is necessary to gain traction. Kitty litter is a fantastic traction compound - plus it is pretty inexpensive. If you are just going to throw it under your tires, you don't need to buy the carbon-laced multi-crystal "gourmet" blend. Most likely, the fewer chemicals the better. This is all really good advice. I am one of the people who swear by kitty litter. I always keep a bag in my trunk during the winter and have used successfully on a couple of occasions. Once I even gave my bag to some truck drivers that were stuck. They looked at me like I was an idiot, but they tried it and it worked. Love your sense of humor too! Great Hub! I've sent this out already to all my snowbound friends. Thanks.